The windows are open, allowing entry of the lavender’s perfume from the south garden bed. If you can get past the shoe-sucking mud season, it’s actually possible to enjoy the change of wind that brings Ohio springtime. And as our only blossoming tree, the weeping cherry is now in full swing. The thing is just gorgeous this time of year. But it pales in beauty next to Miss Holly, amiright? Holly isn’t dazzled by the beauty of the blossoms, however. 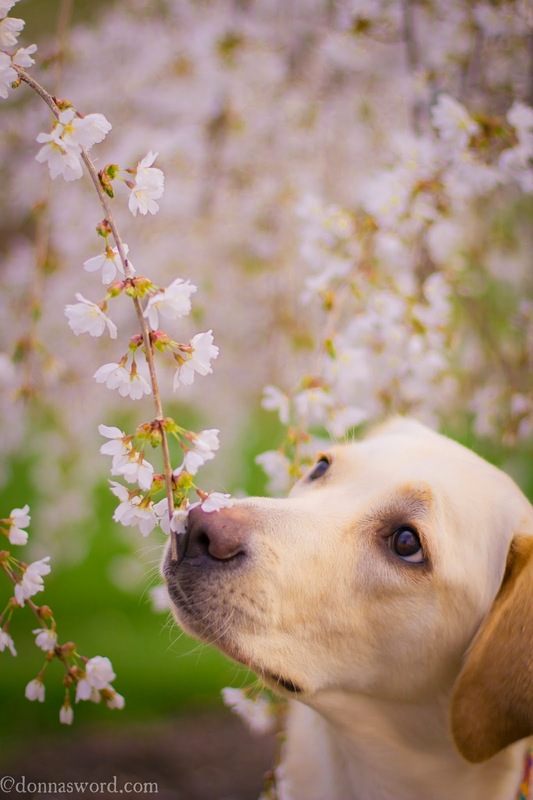 That attentive gaze is bee-lined onto a… well, that’s a honey bee up there. So glad to see these critters are out and about doing their pollination work. I captured a few adorable shots of Holly surrounded by these white blossoms and I think this one may be my favorite. Being in a somewhat artsy mood, I ran this photo through Adobe Lightroom for some editing. A filter or two, along with a vignette gives this image a heavier, warmer feel. Some folk prefer their images SOOC (straight out of the camera), while another may enjoy the mood coming from an altered photo. What do you think? What is your preference … Image #1 above or #2 below? Looking Ahead with the Hero Litter? What a beautiful photo – even before the Adobe work on it. You must be glad to see the spring flowers finally. What a lovely photograph and stunning subject. Brilliant shot! 🙂 They are both wonderful but I lean toward #1. I'm not much of a filter gal. The only filter I enjoy using is black & white. Haha! What a beautiful photo of Holly! 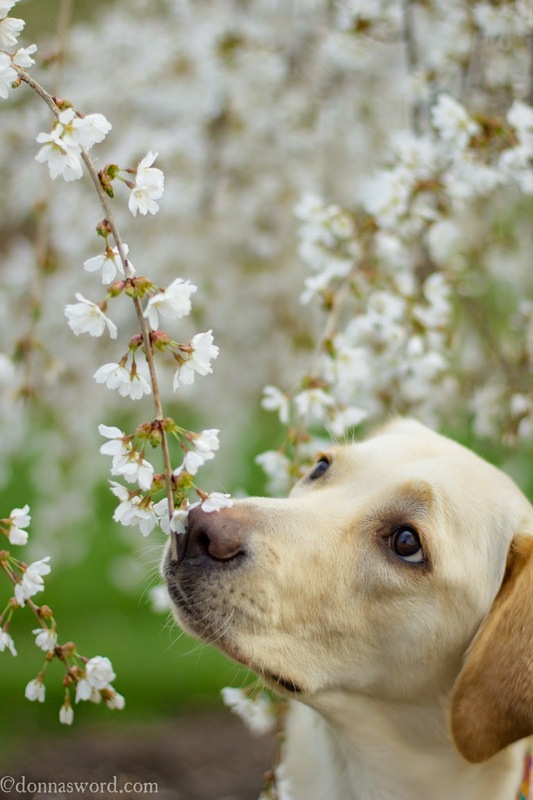 I love photos of dogs sniffing flowers in the garden, precious! Since we planted the weeping cherry (or is it a Japanese cherry, I can never remember), the blossoms have marked the end of winter for us. It's worth the seasonal allergies, lol. Thanks and a happy Wordless Wednesday to you! Thanks so much. Holly makes it easy to get a cute photo since she just won't stay still for more than five seconds. Good point about the white flowers; they do stand out more in contrast in #1. Holly was really pretty darn good around the bee. She just watched it flitter about. We do like to see a lower natural prey drive in the CCI pups and she did well. I love converting shots to B&W sometimes, too. I especially use a B&W filter when I've forgotten to watch the background in the shot and then later I see a big red trash can or something. Thanks for the comment and happy WW to you. Thanks you guys! I appreciate you stopping by and wish you a Happy WW today. I like #1 best too. And I'm a sucker for pictures of dogs with flowers!! Yeah, I'm with you on the dog and flowers thing. Wish I had more blooms around. I'm so bad with planting flowers in the beds that I put out a bunch of coneflowers a couple years ago. They're a hardy plant and can handle my neglect of them very well. I'm much better with dogs, which my household is grateful. She is a pretty thing, isn't she. I keep telling Holly she can't get by on looks alone, but so far she's proving me wrong. Thanks for dropping by and happy WW to you.